Learn about the French Bulldog’s history, diet, and health by reading this French Bulldog guide – discover what makes this breed unique! Despite its name, the French Bulldog can attribute at least part of its heritage back to the UK – where a breed of Toy Bulldog was popular in some regions, such as Nottingham. During the industrial revolution, many Nottingham lace makers emigrated to France, taking their dogs with them. Three decades later – after several crosses with local French flat featured dogs – a new breed was born: the French Bulldog. Since then, they have never looked back – they have continued to increase in popularity, and in 1906, the Kennel Club gave official recognition to the breed. The French Bulldog is also commonly (and affectionately) known as the Frenchie! This breed has seen a huge surge in popularity, with Kennel Club registrations increasing 30 fold in the last 10 years! A mini Molosser-type of dog, the French Bulldog is solidly built, compact and muscular. Its forehead has characteristic wrinkles – as does the bridge of the muzzle, which is short and broad in this brachycephalic breed. “Bat ears” are also a key characteristic of this breed, helping to exaggerate their playful personality. The French Bulldog has a short, dense and silky smooth coat, and only three colours are considered correct – Fawn, Brindle or Pied (white with fawn or brindle patches). The French Bulldog temperament is lively and extroverted; with an abundance of character, the French Bulldog also likes playing with chew-toys. French Bulldogs are also athletic, very affectionate and full of energy. French Bulldog puppies take up to 12 months to fulfil their adult potential – their skeleton and muscles take time to fully form to be able to support this sturdy dog’s active personality. The French Bulldog can have a sensitive digestion, which can be increased by the excess feeding of treats and titbits. Choose a diet which is highly digestible and contains selected fibres and prebiotics to help promote a balance in the intestinal flora. Ideal French Bulldog puppy food: ROYAL CANIN® French Bulldog Puppy. The French Bulldog is active – both outdoors and in! So bear this in mind when it comes to engaging in French Bulldog training, as you’ll be able to give your French Bulldog exercise even on a day of torrential rain. This breed also has a digestive system that can encourage an excess of fermentation, leading to loose stools and flatulence. A diet which contains highly digestible proteins and a careful balance of fibres – including prebiotics – can help to support digestive health whilst minimising stool odour and flatulence. The short, sleek coat of the French Bulldog provides little in the way of physical protection for the sensitive skin of this breed. Its wrinkles and folds can lead to skin irritation or even infection if not cared for sufficiently. Despite its short fur, French Bulldogs can still shed if their grooming needs are left unattended. To minimise your French Bulldog’s shedding at home, a daily brush is advised. A diet providing support for the skin’s natural barrier role is important in maintaining a French Bulldog’s health, their diet should contain omega 3 and 6 fatty acids as well as vitamins, minerals and amino acids. Furthermore, a diet that contains optimal levels of both protein and fat is important to provide fuel for this athletic breed to help maintain the optimum French Bulldog weight. 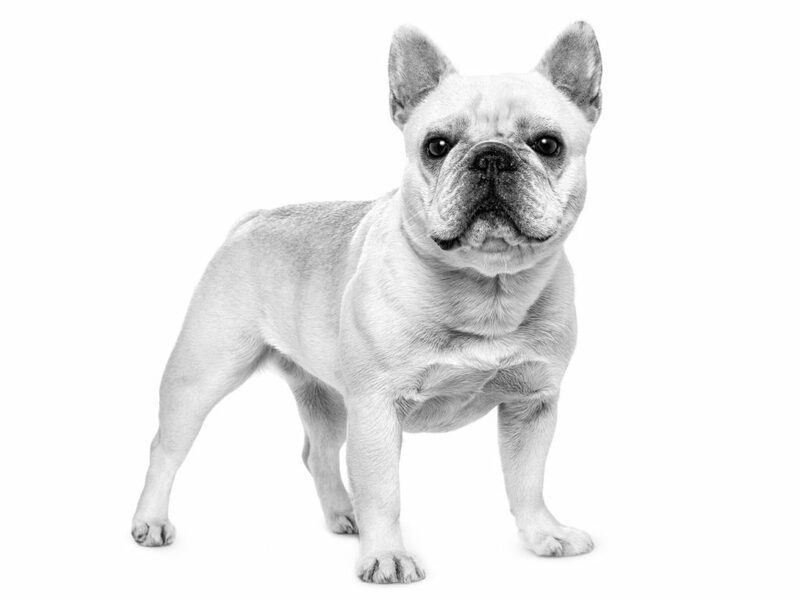 Ideal adult French Bulldog food: ROYAL CANIN® French Bulldog Adult.